Sunday morning service is at 10:30 am, although many people start arriving around 10 to grab a free cup of coffee in our kitchen in Threadgill Hall and chat with old and new friends, or sit in the sanctuary and meditate. Dress is casual--lots of people wear jeans, some wear slacks and sweaters, a handful wear dresses or suits. You can sit anywhere in the sanctuary, no seats are assigned. The service begins with the gentle ringing of a singing bowl, and continues on with song, talking, and silence. 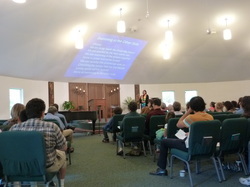 Words to hymns and responsive readings are projected in large type on the front wall. About one third of the way through the service children depart to their Sunday school classes. Once a month we share a multigenerational service, during which the children stay in the sanctuary for the whole service. At the end of the service most people join hands to sing a closing song, but if you would prefer not to join hands, that is fine too. After the service, we move next door to Threadgill Hall for coffee, snacks, and conversation. The minister is always excited to meet newcomers during coffee hour, and answer any question about the church and Unitarian Universalism. On Sunday morning people park in our parking lot, or if it is full (it often fills up by 10:20), there is a lot of residential parking on the streets around the church. We have a bike rack to the left of the front doors. We are accessible by several buses. The parking spaces closest to the entrance to the building are designated handicapped accessible. Our main building which holds the sanctuary is all one story, quite wheelchair and walker friendly, with accessible restrooms and no stairs. Religious Education is held in our Davis Building, just to the east of our main building. It is also one level, without steps, and all rooms are all accessible. Assisted hearing devices are available every Sunday. When you enter the building a Greeter will meet you--they can also get you an assisted hearing device. Restrooms in the both buildings are marked male or female. If you identify as transgender, please use whichever restroom best fits your identity. If you have chemical sensitivities or fragrance allergies you will be happy to know that we are do not use toxic or fragrant cleaning products. We do ask that congregants refrain from wearing fragrance, but of course we cannot guarantee that they will abide.